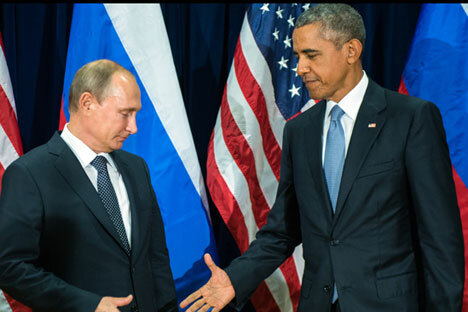 A much-awaited meeting between Vladimir Putin and Barack Obama on the sidelines of the 70th UN General Assembly session left major issues of contention between them unresolved. A list of the key issues belying agreement on cooperation in the war against ISIS is outlined. The future of Syria’s President Bashar al-Assad remains the main cause of disagreement between Russia and the United States. Assad’s removal from power appears more critical for the US than even the fight against the Islamic State (IS). Too many political resources and too much propaganda has been spent on the war against the Assads, father Hafez and son Bashar. To step back now would mean acknowledging a mistake and demonstrate weakness. The United States is betting that the secular opposition will refuse to cooperate with Bashar al-Assad, who has officially been branded as a “tyrant.” Washington insists that the Syrian president must leave, after which opposition units will unite with the remains of the army and continue the battle with the IS extremists. Russia, on the other hand, stresses that only Assad can be considered the legitimate leader of Syria, who is currently irreplaceable, and it is his army which is seriously fighting against the IS. However, Moscow is not idealizing Assad and is making it clear that Syria needs political reform, but without involvement of external forces. The Kremlin is suggesting a pragmatic approach: tackle IS and defeat them first, then deal with political reform through negotiations between the government and opposition. Moscow has made it clear that it is prepared to join the anti-jihadist coalition but insists that such a coalition receive a mandate from the UN first. This is necessary to clearly define the “game rules” and avoid repeating the mess in Libya where, under the pretext of protecting the civilian population, western countries ousted Muammar Gaddafi and left a chaotic political vacuum. The Kremlin seeks a resolution from the UN Security Council which will clearly outline the goals of an international coalition and the means of fighting the Islamic State in Syria (ISIS). Moscow supports Iran’s involvement in fighting ISIS and managing the Syrian crisis. However, monarchies allied to the US in the Persian Gulf, especially Saudi Arabia and Qatar, bitterly oppose this move as Iran for them is a rival in the regional struggle for dominance. The Syrian crisis is, in many ways, a consequence of the Iranian-Saudi rivalry. Tehran is assisting Assad while the jihadists receive financial support from the Gulf countries. The agreement on Iran’s nuclear program, signed in July, should change Iran from an international pariah into a fully acceptable negotiating partner for talks in the eyes of western public opinion. The problem will more likely be from the Arab monarchies which are still unwilling to compromise with Tehran. There are two competing de facto anti-jihadist coalitions in the region so far; one supported by the United States and Saudi Arabia, while the other includes Russia, Iraq, Iran and Assad’s government. The 2016 race for the presidency has begun in the USA. One of the accusations aimed at the Democrats is indecisive foreign policy. It is important for Barack Obama to show resolution and consistency, particularly with regard to Russia, which the American media is positioning as the new “Evil Empire”. For Putin, the possibility of success in the fight against ISIS will give allow him to showcase not only to the world, but also to show his domestic constituency that the nation’s leader is firm, decisive and capable of returning Russia to the status of a great power.